We are so pleased you have chosen the original Peacock Pavers for your hard surfaces, both interior and exterior. Now is the time to take the next step to protect them from weather, environmental or liquid spills that could stain or discolor the surfaces. Like all porous hard surfaces, Peacock Pavers are subject to damage if they are not sealed after installation. 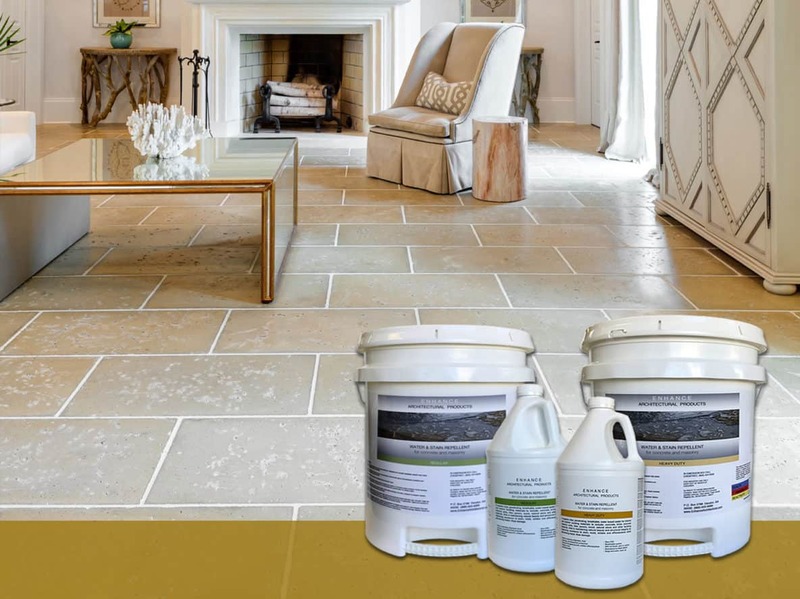 We have found the best product to seal our pavers – Enhance Architectural Products sealer – and made it available through Peacock Pavers. Now you can get all you need to complete and protect an installation of Peacock Pavers directly from us. Call or email to order the best sealers to preserve the beauty of your Peacock Pavers and protect your investment. The Enhance Architectural Products sealer is available in both a regular and heavy duty formula. This sealer is a proprietary mix that resists the absorption of water-based and oil-based contaminants, making sealed surfaces easier to clean. It also protects from stains caused by contaminants. The sealer provides a clear, breathable and penetrating seal that will not affect the surface appearance of the pavers.